Mid Yorkshire offers delightfully varied countryside and traditional villages which are perfect for exploring on your bike. Over the last two decade, moutain biking has developed enormously as a "sport". We greatly admire the technical and athletic capabilities of modern day mountain bikers and recognise that many excellent mountain biking guides have been written and custom-built trails set up. As Ellie’s fiftieth birthday approaches and her ambitions of a steady income, a successful career and an ascent of Everest seem as far away as ever, she begins to doubt she’s capable of achieving anything at all. So when her best friend Mick suggests a gruelling cycle ride from Land’s End to John o’Groats, she takes up the challenge. of maps, using handrails and taking a bearing. This new title is in an improved series of Paul Hannon's walking guides. A range of enhancements see two previous titles merge to cover a broader, logically grouped area - in this instance the neighbouring Nidderdale and Ripon areas. The route to this wonderful walk starts and finishes in Pateley Bridge, a typical small Dales town centred around the 18th century bridge over the River Nidd. The 54-mile waymarked Nidderdale Way starts and ends in the market town of Pateley Bridge, and can be walked comfortably over four to six days. 22 well-researched and legal routes over fabulous open moorland and forests of the North York Moors National Park. All routes are clearly described and illustrated with full-colour maps and evocative photography. 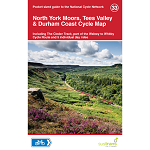 North York Moors Mountain Biking - Moorland Trails is the ninth title in this bestselling series of UK mountain bike guidebooks and features 21 routes in the North York Moors National Park, between 10km and 77km in length, suitable for all levels of mountain bikers. This unique map to the North York Moors from North SplashMap is on weatherproof fabric and designed for the REAL outdoors. This area map shows the National Cycle Network and local routes in this area. It covers the North York Moors, the Cinder Track, the eastern part of the Walney to Wear Cycle Route and five individual day rides. 40 coast and country walks that take in the very best the glorious North York Moors have to offer. North Yorkshire is an ideal place to walk with a dog. 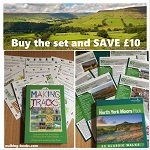 On offer are ancient paths, heather-clad moors, picturesque dales, woodland, beaches and pretty villages. There are also plenty of opportunities for off-the-lead romps, paddles and swims. This map details the fantastic Way of the Roses cycle route which runs from Morecambe on the Irish Sea to Bridlington on the North Sea. 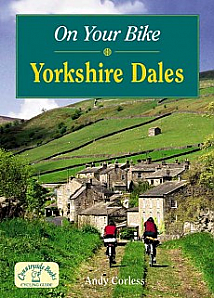 Twenty circular rides include routes throught the Yorkshire Dales. 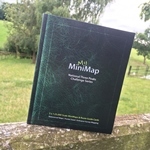 Map sheet number OL2 in the OS Explorer map series is the ideal map to use when exploring the South and West areas of the Yorkshire Dales including Whernside, Ingleborough & Pen-y-ghent. The Yorkshire Dales National Park is perfect for all outdoor enthusiasts. The OS Explorer Outdoor Leisure 26 covers the area of the North York Moors (Western Area, showing part of the National Park and Cleveland Way) on a scale of 1:25000.